Assists in the growing and distillation of Australian natives. 55 Station St, Mullumbimby NSW 2482. 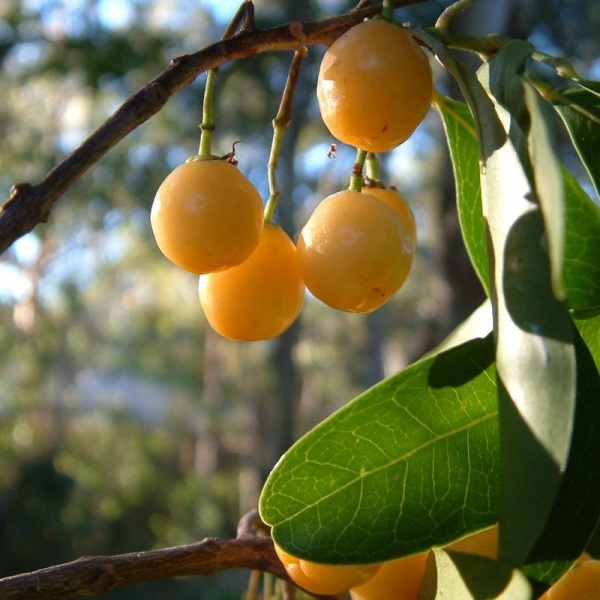 Species suitable for temperate/cool climates, including: Illawarra plum, Mountain pepper, Cool climate Syzygium spp, native herbs and teas. Santalum spicatum (Australian Sandalwood) Propagated to order for Autumn and Spring planting. In biodegradable tubes with host plants. $3.50 each. Bunya Pine, Brachychiton, Cissus, Syzygium, Lomandra, Macadamia, Podocarpus, Santalum. Phone for full seed list. $1.80 for 15gm resealable jar, $50 per kilo. Premium quality. Certified ANSAS (chemical residue free) and processed to HACCP standard. carries a wide selection of rainforest bushfood species. consultant and specialist grower of Tasmanian Native Plants. Are you buying or selling? Be seen here. Call, fax or email to find out how easy it is. Back copies of Issues 1,2,3,4,6,7,8, 14, 15 are still available at just $4.95 each! Don't miss out on the news you missed out on! ABm, 41 Coral St, Maleny, Qld 4552. "How can we know these people if we do not know their stories? This is a very simple concept - the creation of reconciliation bushfood gardens throughout the country. Those these gardens, and their stories, can only be designed by Aboriginal people, the creation of the physical gardens can and should be a shared experience. The magazine is calling for expressions of interest from anyone who wants to be part of the Reconciliation Gardens program. At the moment, everything is needed - but mainly support and enthusiasm. A Reconciliation Garden Association will be formed so that appropriate funding can be sought and a representative committee formed. Our first step is to gain the approval and support of the people themselves. Is this an appropriate way in which we can come to work together? The next step is to get support, funding and sponsorship. Nurseries, local councils, Landcare groups, Rotary - we won't be asking for support, but suggesting they become involved. The magazine has begun a campaign to keep the media involved and intrigued and this will continue. The magazine has built up a species list and is linking this to various regions and groups. so if you feel you can be part of the Reconciliation Gardens concept, please contact us for further details. Ph: 07 5494 3812. Fax: 07 5494 3506.